The Invacare® Top End® T-5 7000 Series Tennis wheelchair is faster, lighter, stronger and better than its predecessor! 7000 series aluminum material, enhanced head tube design and axle securing system improve performance and reduce overall weight by 2 lb. Who doesnt want that? 7000 Aluminum reduces the overall weight of the chair by 2 lb., making it comparable in weight with titanium frames. The big advantage of 7000 aluminum is three-fold. One, the material is approximately 23% stronger than 6061 aluminum. Two, since the material is stronger, we are able to reduce the wall thickness of the aluminum tubes, reducing the overall weight. Best of all, the rigidity and strength of a 7000 aluminum frame is further enhanced by Invacare® Top End®s sophisticated heat treating and powder coating process. 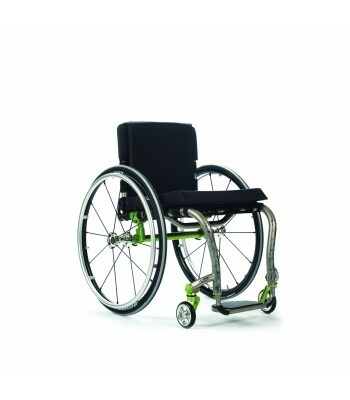 The Invacare® Top End® design team has made improvements in multiple components on the T-5 7000 Series Tennis wheelchair. The head tube design includes precision components that maximize stiffness, reduce play and improve overall responsiveness of the casters, plus it is lighter weight. Axle receivers will now be locked onto the frame using the bolt securing system. This system minimizes axle play so that a players rear wheels are secure and solid for a confident feel. Lastly, sleek curved frame members add a sharp look to the camber tube and swivel anti-tip. 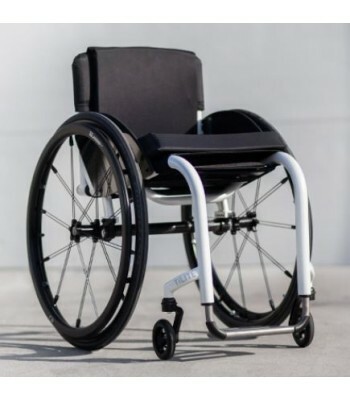 Each T-5 7000 Series Tennis wheelchair is custom built to each individual athletes specifications and this process is overseen by Paul Schulte himself, the General Manager and design engineer for Top End® and member of the USA National Mens Wheelchair Basketball Team. --- Please Select --- 12" 12.5" 13" 13.5" 14" 14.5" 15" 15.5" 16" 16.5" 17" 17.5" 18" 18.5" 19" 19.5" 20" 20.5" 21"
--- Please Select --- 12 12.5" 13" 13.5" 14" 14.5" 15" 15.5" 16" 16.5" 17" 17.5" 18" 18.5" 19" 19.5" 20" 20.5" 21"
--- Please Select --- 8" 8.5" 9" 9.5" 10" 10.5" 11" 11.5" 12" 12.5" 13" 13.5" 14" 14.5" 15" 15.5" 16" 16.5" 17" 17.5" 18" 18.5" 19" 19.5" 20" 20.5"
--- Please Select --- 12" 13" 14" 15" 16" 17" 18" 19"
--- Please Select --- 1" 1.5" 2"
--- Please Select --- 6" 6.5" 7" 7.5" 8" 8.5" 9" 9.5" 10" 10.5" 11" 11.5" 12" 12.5" 13" 13.5" 14" 14.5" 15"
--- Please Select --- 1" 1.5" 2" 2.5" 3" 3.5" 4" 4.5" 5" 5.5"
--- Please Select --- With risers 2" With risers 4"
--- Please Select --- 14" 14.5" 15" 15.5" 16" 16.5" 17" 17.5" 18" 18.5" 19" 19.5" 20" 20.5" 21"
--- Please Select --- 3" 3.5" 4" 4.5" 5" 5.5" 6"
--- Please Select --- 2" to 4" 3" to 5" 4" to 6"
--- Please Select --- 15" 16" 17" 18" 19"
--- Please Select --- 8" 8.5" 9" 9.5" 10" 10.5" 11" 11.5" 12" 12.5" 13" 13.5" 14" 14.5" 15" 15.5"
--- Please Select --- Short 9" to 11" Low 11" to 14" Med 14" to 18"